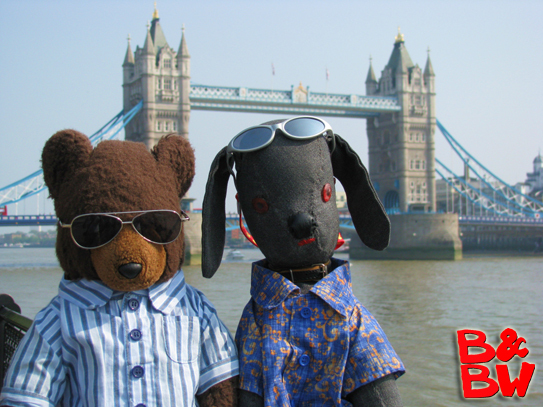 Surprising, but true - world travelers that they are Bear and Bow Wow had passed through Heathrow Airport on numerous occasions, but did not make their first visit to the UK until April 2011, spending four days in London over Easter. 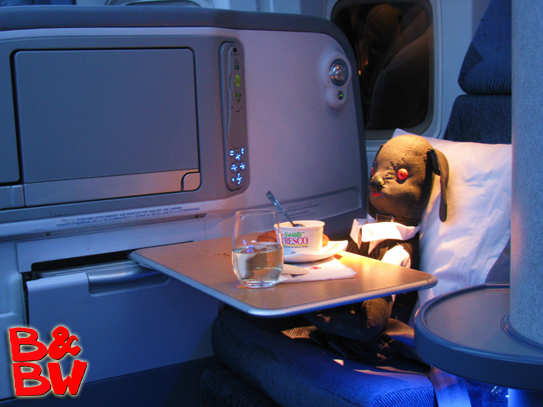 Comfortably settled in his Executive First Suite on the Air Canada flight to LHR, Bow Wow tucks into some cookies and ice cream with a nice glass of Chardonnay before turning in for the night - just like at home. Move your cursor over the image for a close-up. Strong monarchists, the boys had always been very fond of Diana, Princess of Wales and are indeed still saddened by her death. 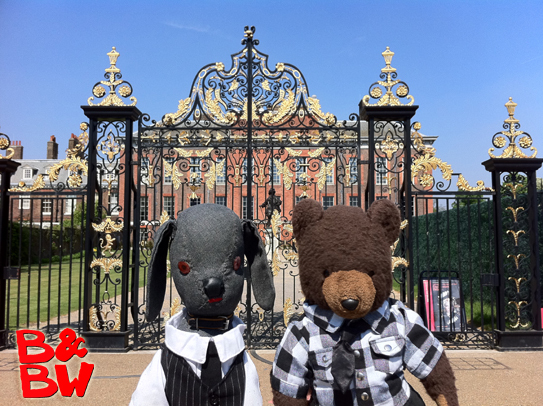 Naturally, their first stop in London was to Kensington Palace the late Princess' former residence. 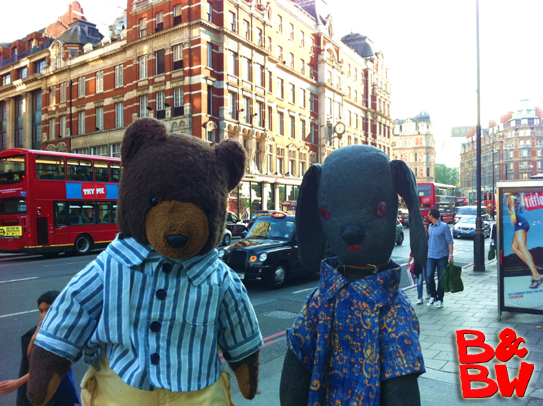 Following in the steps of Ab Fab's Patsy and Eddie, the boys headed to Harvey Nicks. 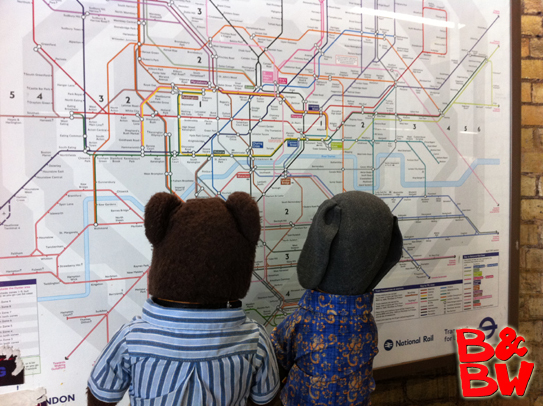 Bewildered at first by London's famous Underground map, Bow Wow was quickly able to figure out the simple colour-coded map.Move your cursor over the image for a different shot. 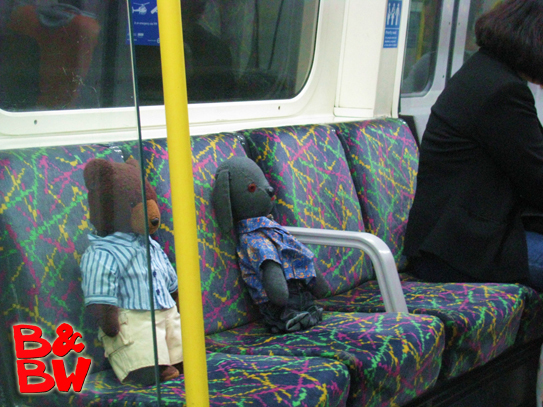 Equipped with Oyster cards, they were able to zip around London on the Tube with relative ease. Move your cursor over the image for a different shot. 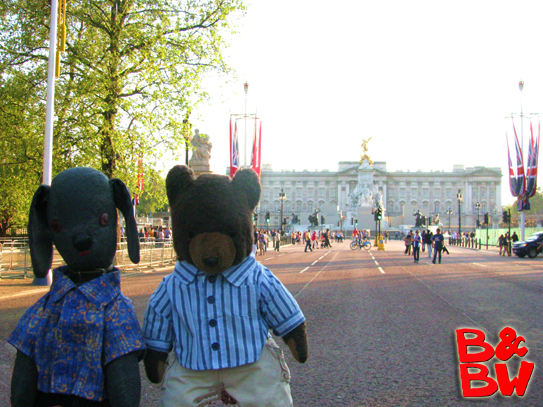 Next it was off to see the Queen at Buckingham Palace. Move your cursor over the image for a different shot. 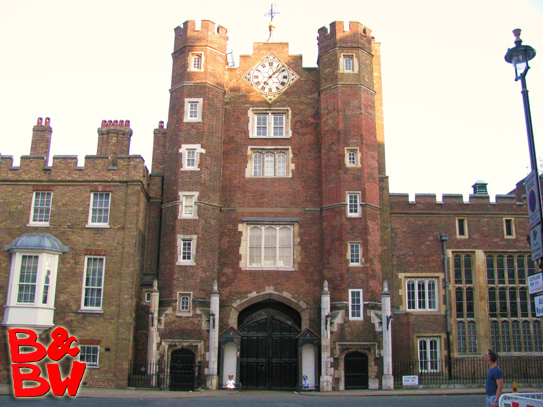 The boys offered to fill in for the guards at St. James Palace while they went for a quick smoke. Sadly the uniform was not included. Move your cursor over the image for a close-up. 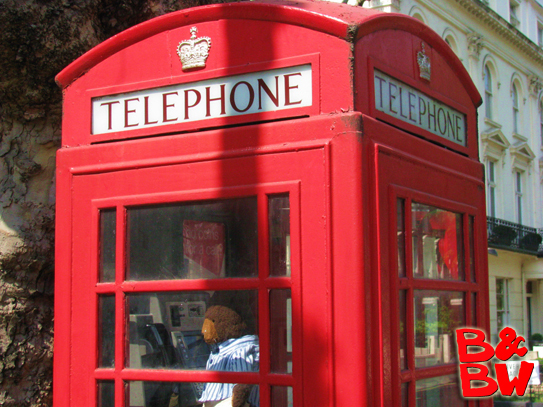 Frugal Bear saves on expensive roaming charges by using a public phone rather than his mobile. 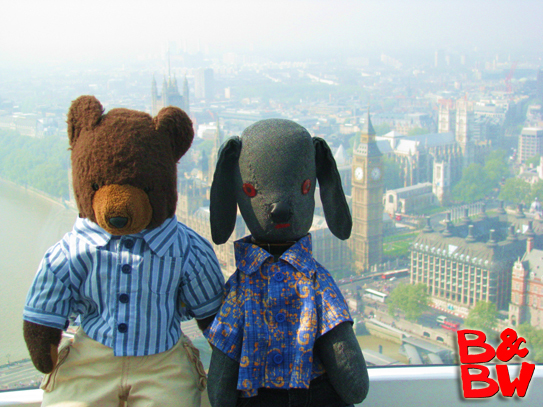 The boys lucked out with great weather the whole weekend which meant they got great views on the London Eye. Move your cursor over the image for a different shot. 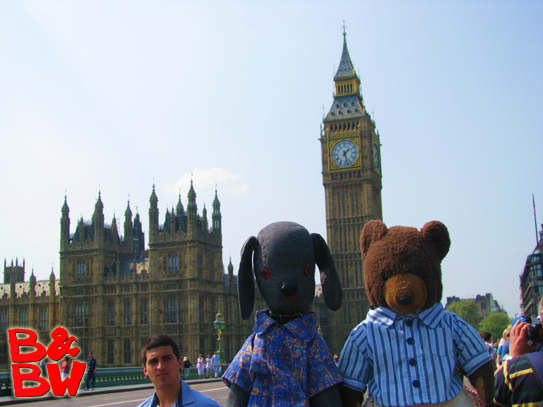 The obligatory photos in front of Big Ben. Move your cursor over the image for the second shot. 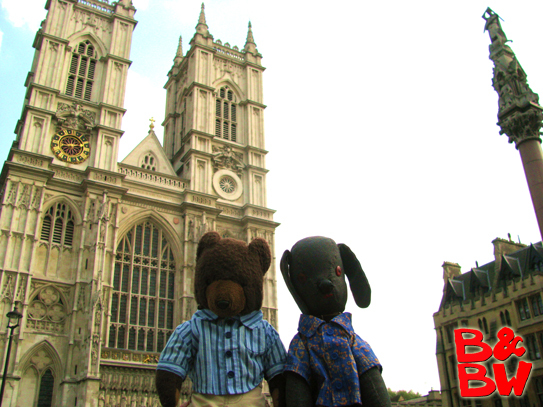 The boys arrived at Westminster Abbey five days too early for the wedding of William and Kate. 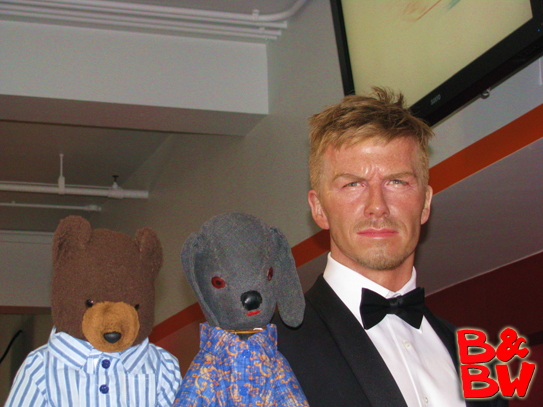 Hangin' with Becks - the boys had a chance to get caught up with David Beckham. 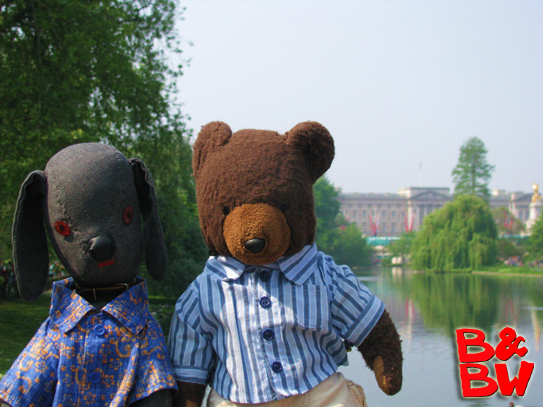 Posh was a no-show. 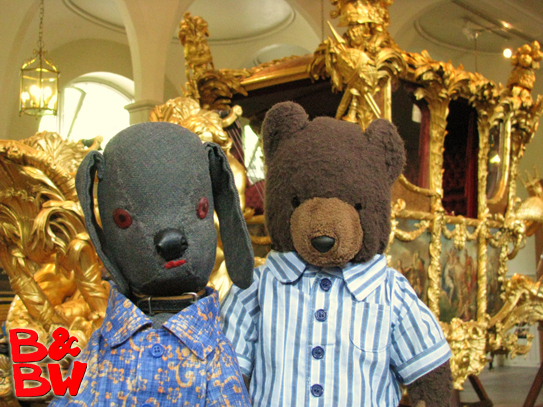 At Buckingham Palace the boys visited the Royal Mews. Here they are in front of the Gold State Coach, used only for coronations and other big royal events, such as Jubiliee celebrations. Move your cursor over the image for a close up of the carriage. 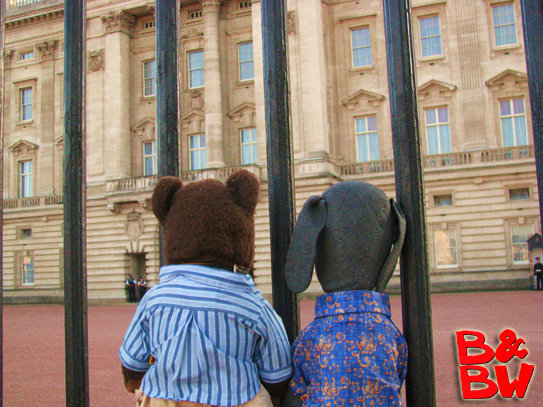 For the boys, as it is for most first time visiters to London, watching the Changing of the Guard at Buckingham Palace was a highlight of the trip.